Our four groups teed off on time and in excellent weather, with no threat of rain visible. The weather stayed fine throughout, and whilst it was warm, it wasn’t as hot or as oppressive as it has been of late. The stylish clubhouse at Phoenix. As noted after our last visit, Greenwood’s greens are still suffering with many having large grassless areas where green-coloured sand has been used as a fill-in. In some cases this made putting difficult as uneven surfaces took their toll. I suspect the adverse effect on putting was as much visual as anything else, as some still managed to score well. There were no ‘2’s which would have pleased those on the podium. The result was a close-run affair for the minor places as many golfers scored in the low to mid-thirties. Three who did just enough to share runner-up spot were Toby Glass, Huw Phillips and David Thomas who all managed 34 points. Out on his own by three shots was Dave Edwards, having his first game since returning from England. Dave’s one-under net par round was particularly meritorious given the dubious nature of many greens. Back at the Links Mr Len drew the name of Stuart Thompson as the day’s lucky beer winner, his second in succession! Graeme “Biscuit” Kerr, having only his second game with the PGS, won the booby bevy for having the misfortune of playing with three golfers who all managed 34 points. 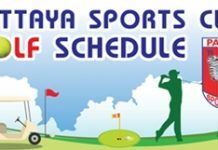 July began for the Pattaya Golf Society with a holiday visit to Mountain Shadow for a stableford competition off the blue tees. Though not long, the course is always a challenging one with off-fairway dangers in the trees and occasional water waiting to catch the loose shot. The course was in fine condition with grassed fairways and consistent quick greens and an empty track gave the group the relaxed feeling necessary for good scoring. Sharing second place were the long hitting Toby Glass and the more conservative Mr. Len, both recording 30 points; Toby’s score bolstered by a birdie on the tough par five fourteenth. There were no ‘2’s winners and Paul Hird from Leeds showed his credentials with a level par round of 36 points, which included a near albatross on the eleventh hole where he saw his second shot graze the hole before finishing about a foot behind. “Three for five” certainly helped his score. The non-winners beer draw was won by Johannes Murken while both Alans in the field, on their return, shared the Booby Bevy after one lost a lens from his spectacles on the thirteenth and the other lost his way completely with his worst round for many a long day. None of this detracted from the day however and an empty course for less than 1k baht on a holiday just could not be beaten. Well done Mountain Shadow! In its constant quest for excitement and interest for golf days, the Pattaya Golf Society visited Phoenix on Friday to play a stableford competition in two flights from the blue and white tees. Phoenix off whites may be a little short for some golfers but the same cannot be said off the blues and a challenging day lay ahead for half the two dozen strong field. The Mountain and Ocean nines were in excellent condition with grassed fairways offering some run and consistent greens with good “roll”. The only downside was the state of the bunkers and Phoenix could make a lot of “moolah” if the club sold 75% of the sand to a builders’ merchant. There would still be enough on the course to spare! In the competition proper, the White flight saw Toby Glass and Mr. Len again share runner-up place with 34 points, a country mile behind the winner, Markku Tynell, with 41 points. It was a phenomenal round by the Finn and his 23 points on the Mountain nine belied his heady handicap status. The only birdie ‘2’s were in the Blue flight, with Billy Shepley, Paul Hird and Mike Dabanovich sharing the pot for their efforts on Ocean 7. The non-winners beer was won by Paul Hird and the Booby Bevy went to Gary Bolger for his “mare” of a round, split into 5-16 points. 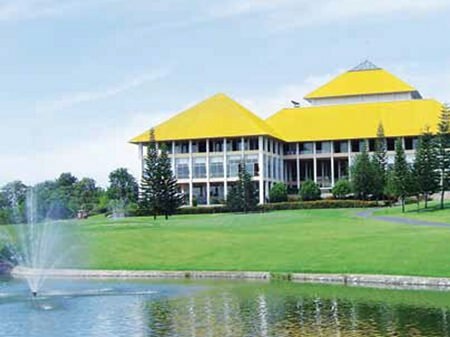 Phoenix is always a treat for Pattaya golfers but this time the change of format gave the day much more zest. However the common white tees lie in wait for the next visit in a couple of weeks…or maybe not?